authorization code which is then used to make the POST to request the access token (basically following what I did in my previous post when I walked this through manually in the browser/Fiddler). The AAD team are continuing to evolve the samples and NuGet packages that can be referenced when authenticating with Azure Active Directory. In this post I’m going to add authentication to the Windows platform applications using the Active Directory Authentication Library (package id: Microsoft.Indentity.Clients.ActiveDirectory) and the corresponding sample found on github (https://github.com/AzureADSamples/NativeClient-MultiTarget-DotNet). 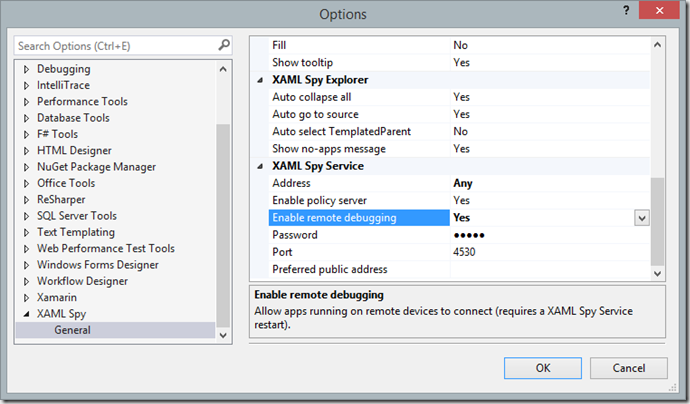 One limitation of the current ADAL is that it doesn’t support Windows Phone 8.0 – adding support for this platform is slightly harder than for universal applications as there is no WebAuthenticationBroker so doing authentication will have to be done via a hosted web browser control within the application. The first step in adding authentication support across the applications is to a reference to the ADAL package. 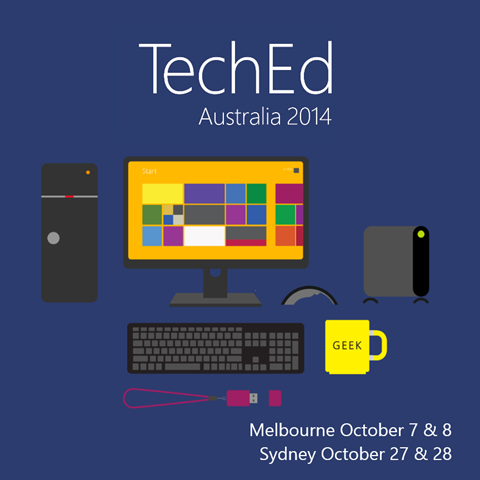 I’ve added it to the Windows and Windows Phone 8.1 projects, as well as the iOS and Android XForms applications. 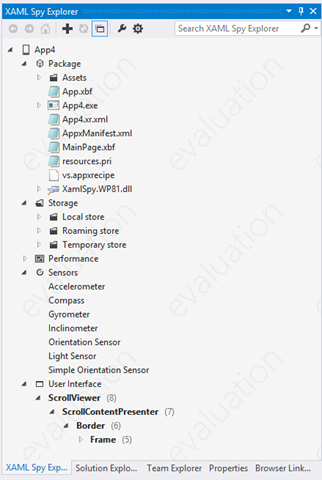 As the package doesn’t support WP8.0 it can’t be added to either the XForms portable class library, the Core portable class library, nor the Windows Phone 8.0 projects. At this stage we’ll exclude the Mobile Service project as we currently don’t need ADAL there. 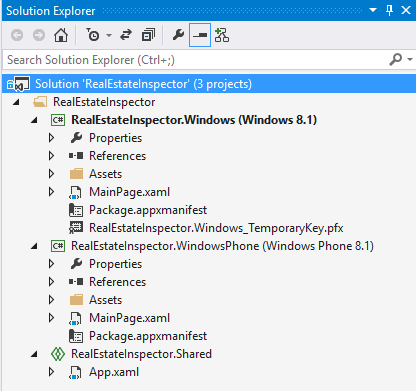 Into the RealEstateInspector.Core portable class library I’m going to add a Constants class which contains the various values required when requesting the authorization code and access token using the ADAL. 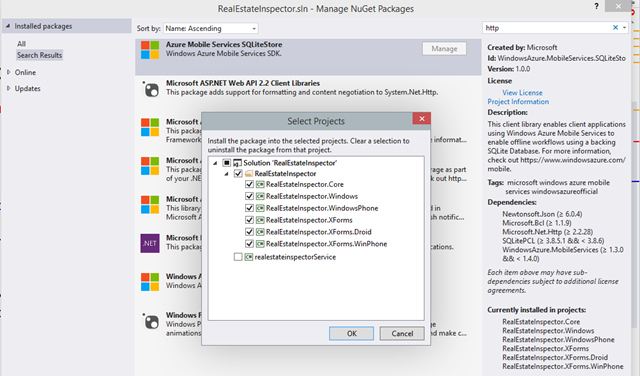 Rather than having to duplicate the authentication code between each of the client projects I’m going to create another Shared project called RealEstateInspector.Shared.Client and add a class called AuthenticationHelper. I’ll add a reference to this project to all of the client projects, except the Windows Phone 8.0 project, since this is currently unsupported. And I’ve made a simple tweak to the LoadPropertyData method to accept the access token as a parameter. 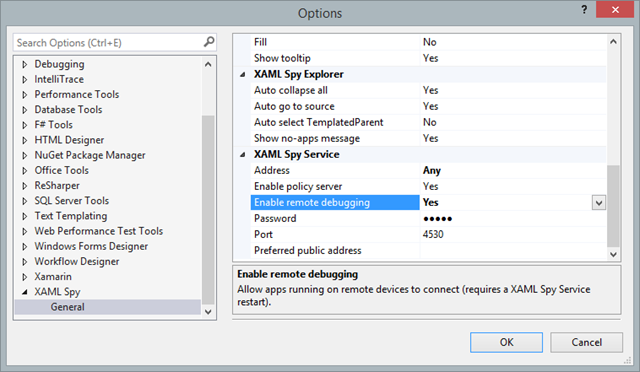 The last thing to do is in the App.xaml.cs file to add an override to the OnActivated method. 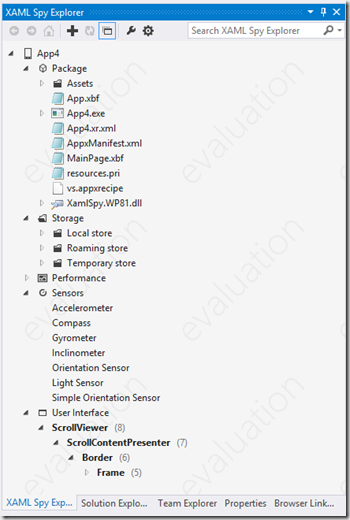 Note that this is required due to the differences in the WebAuthenticationBroker implementations between Windows and Windows Phone 8.1. At this point whilst we’ve added references to ADAL to the client projects, the only applications that can be run and signed into are the Windows platform applications (Windows and Windows Phone 8.1). 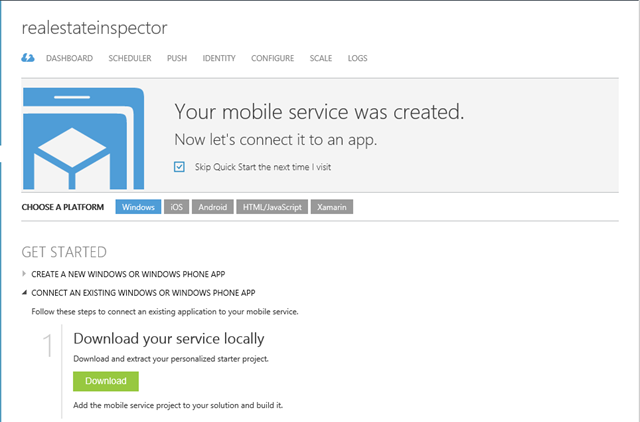 So far I’ve only had support for the new Windows platform clients (ie Windows and Windows Phone) for my Real Estate Inspector sample app. However, to make it successful we need to target more platforms. To this end I’m going to add support for iOS, Android and Windows Phone 8.0 using Xamarin.Forms. 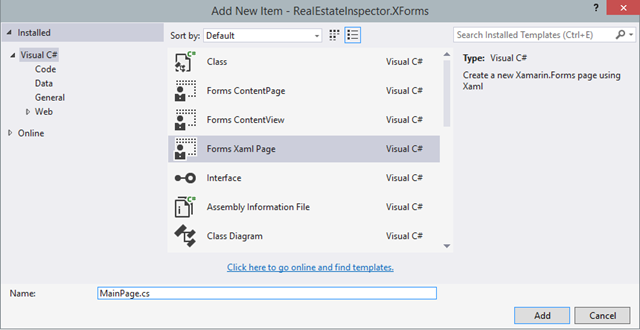 After installing the Xamarin tooling for Visual Studio, I added a new project using the Blank App (Xamrain.Forms Portable) template. 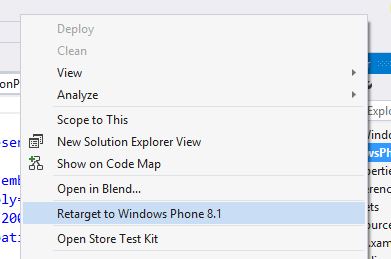 This actually look multiple attempts as I hadn’t updated the Xamarin tooling prior to creating the projects. I would highly recommend upgrading the tooling first! This will give you three target projects Driod, iOS and WinPhone, in addition to a PCL which contains the common code and ui for the applications. You should be able to build and run each of these targets – however, you’ll need to either register for a trial or have a Xamarin Business subscription. Since the UI is help in the PCL project, it’ll be the same across all the targets, although there may be platform rendering differences. Now that we have these three targets, we’re going to have to connect up our Azure Mobile Service, work out how we’re going to deal with navigation and structure our solution to maximise code reuse across our Windows platform projects. One of the core requirements of our real estate inspection tool is that it’s available offline. To this end I can leverage the synchronisation component of the Azure Mobile Service SDK to synchronise the entities we referenced in the previous post. 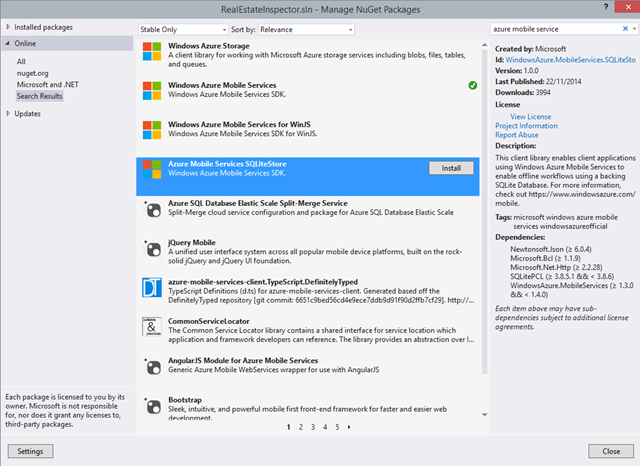 In order to make use of this I will need to add another NuGet package which is the WindowsAzure.MobileService.SqliteStore package – you can think of this as the Sqlite storage wrapper which will handle persisting and providing an access layer to the offline data. One thing you may notice that that there is a warning in your References list after adding this NuGet package. In this case you either haven’t got the Windows/Windows Phone Sqlite Extensions installed, or your version doesn’t align with the reference that was added as part of adding the previous package. After making sure you have the most recent version of the Sqlite extensions installed (get them from the Sqlite Download Page), you can then simply delete the reference with the warning, and then add a new reference to the extensions you just installed. Next, you’ll probably still see warnings against the Sqlite and Visual C++ references – this is because neither of these references supports compiling using the AnyCPU option. Switch to building for one of the other platforms (x86 is probably the easiest to use for development since it’s compatible with the Windows Phone emulator, just don’t forget that if you’re testing on an RT device or on a real Windows Phone, you’ll need to use an ARM build). Invoking a sync is actually a two part process. First you need to pull data down from the Mobile Service. Here we’re passing in a default table query (which will pull down all entities in the table), and using the name of the data type as the synchronisation key. I repeat this for both entity types I want to synchronize. You’ll notice that I’m calling GetSyncTable instead of GetTable – this is because I want to reference the local offline table, rather than the Mobile Service endpoint. Now that I’ve pulled data down from the Mobile Service I can call ToListAsync on the sync table to retrieve all the elements that are contained in the offline table. Of course this only adds them to the local offline table. To push them up to the Mobile Service I call PushAsync on the synchronization context. And you can use the SQL query window to write and execute sql to view the data. 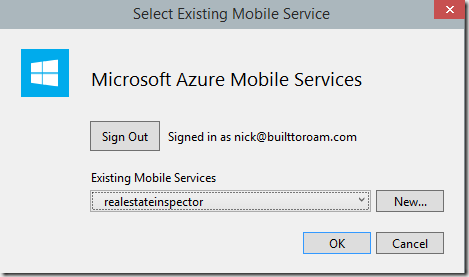 In my previous post I extended the Azure Mobile Service to include two entities, RealEstateProperty and Inspection. I’m now going to return to the Windows platform projects (ie Windows and Windows Phone) and update them to use these new entities.Rather than duplicate the entity definition I’m going to reuse the entity definition I created previously. Unfortunately, the base class of the two entities is a class called EntityData which is specific to Azure Mobile Service SDK for the full .NET Framework (ie to power the .NET backend services). This means we can simply move these entities into a class library, or better still a PCL, and reference it. Instead we’ll need to make the base class conditional on where the entities are being used – this is a great use for a Shared Project. We already have a Shared Project which is used to share common code between the Windows platform projects. One option would be to simply reference this project from the service project but this would mean we couldn’t include any shared XAML or Windows platform specific code. Instead I’m going to create a new Shared Project which will be used to contain the entities that are going to be shared across both the Windows platform projects and the service project. 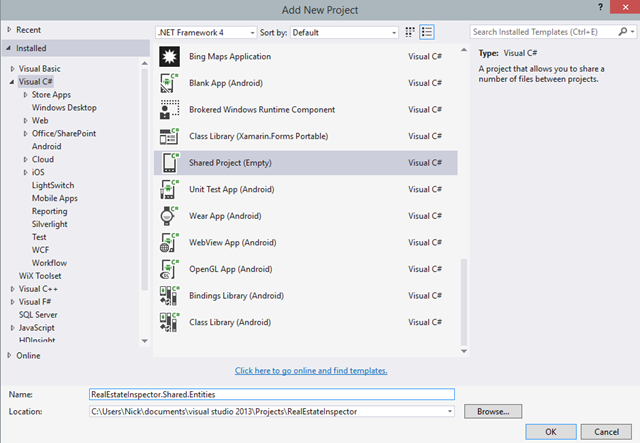 To do this I need to download and install the Shared Project Reference Manager which extends Visual Studio to allow for the easy creation and referencing of Shared Projects. 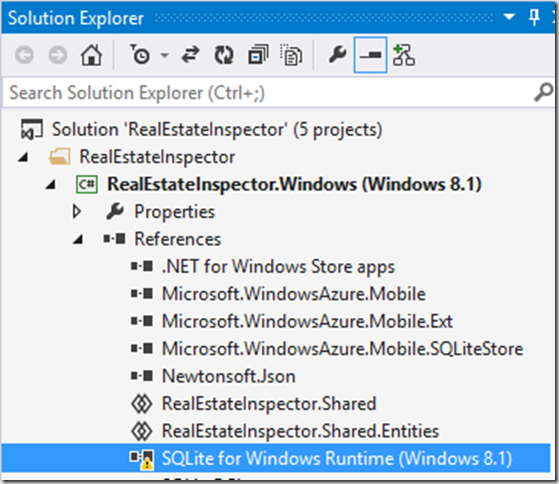 After installing the extension I simply add a new project as I would any other project type – right-click the solution node in Solution Explorer and select Add –> New Project. Select the Shared Project and give it a name, in this case will keep it inline with the other Shared Project by naming it RealEstateInspector.Shared.Entities. 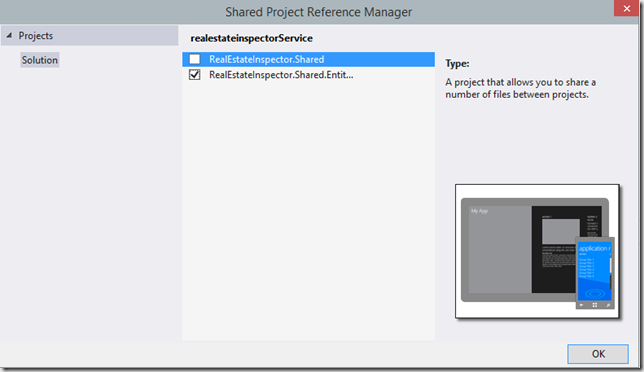 With the Shared Project created, I need to add a reference to the Shared Project to both Windows platform projects and the service project – right-click the References node under the project and select Add Shared Project Reference. 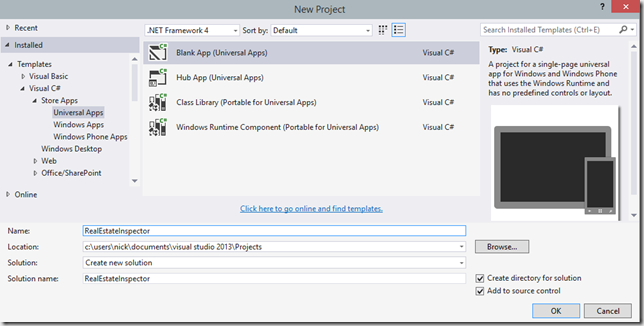 The two Windows platform projects should have both shared projects selected, whilst the service project should only reference the new Shared Project. Next I need to move my entities out of the service project and into the shared project. I’ll also take this opportunity to change the base class, which as you’ll see will allow us to provide a different base class implementation depending on whether the entities are being compiled into the windows platform projects or the service project. You’ll notice that the BaseEntityData makes use of a compilation symbol to firstly control the base class (ie use the EntityData class if SERVICE is defined) and secondly whether the Id property is defined. The SERVICE symbol isn’t a predefined symbol so I’ll need to define that in my service project. I could have switched the logic to use one of the existing symbols, such as WINDOWS_APP but then if we ever extend this to other platforms, I’d have to modify the logic. It seems better to simply add a SERVICE symbol to the service project. 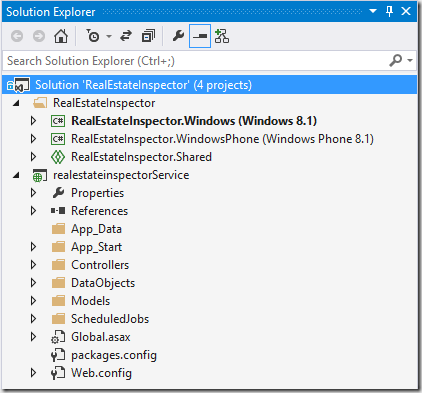 Double-click the Properties node under the service project in Solution Explorer and then open the Build tab. 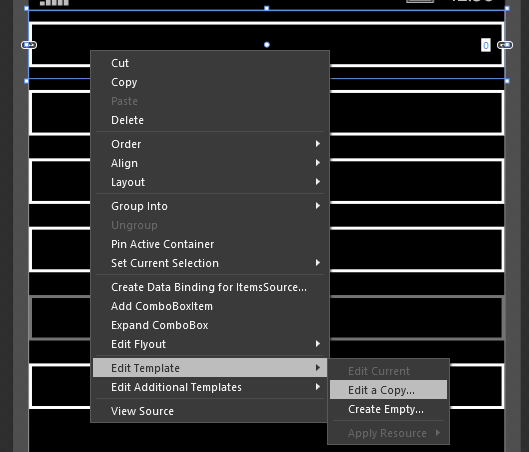 Make sure you select All Configurations before adding SERVICE to the compilation symbols. Whilst I’ve refactored the service code, there’s no reason to publish the new version since we haven’t modified the structure of the entities. However, there should be no harm in doing so if you’d like to keep the service up to date. 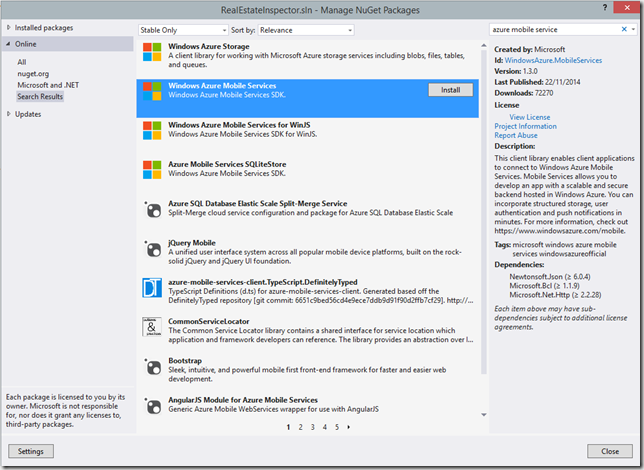 In my previous post I created Windows and Windows Phone applications using the universal app template, and created and published a Mobile Service, The next step is to connect the apps to the Mobile Service using the Windows Azure Mobile Service NuGet package. 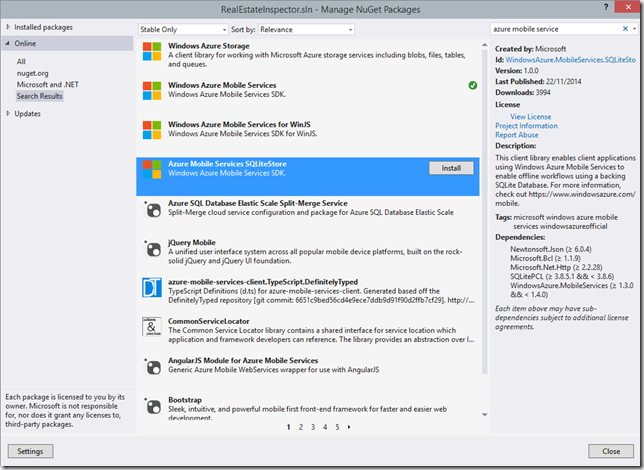 In my solution I simply right-click on the solution node and select manage NuGet Packages. 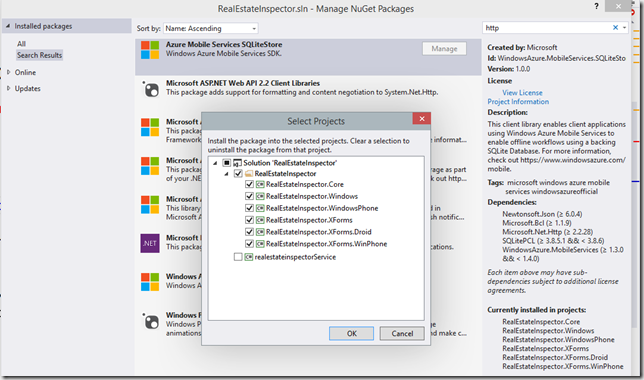 Locate the NuGet package by searching for “azure mobile service” and click Install next to the SDK package. 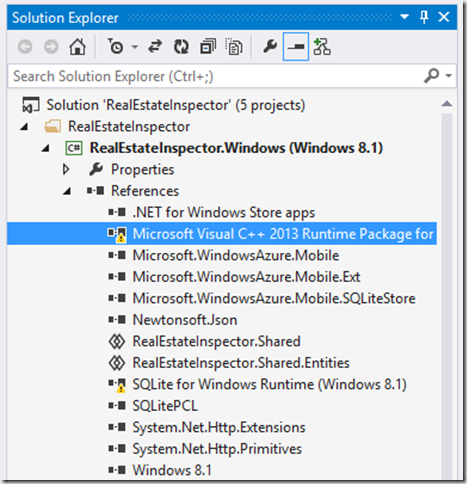 Add the SDK to both Windows and Windows Phone projects but not the Service project. I can run either the Windows or Windows Phone application and see that the items variable gets populated with the contents of the TodoItems table. 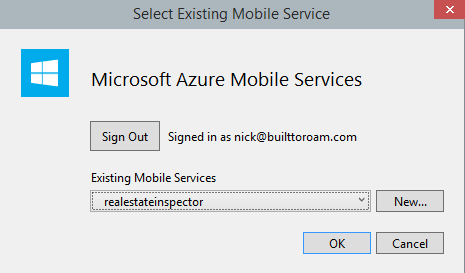 Of course we need to switch out this table with one that is more applicable to the property inspector application I’m building but this demonstrates how easily you can retrieve data using the Azure Mobile Service SDK. 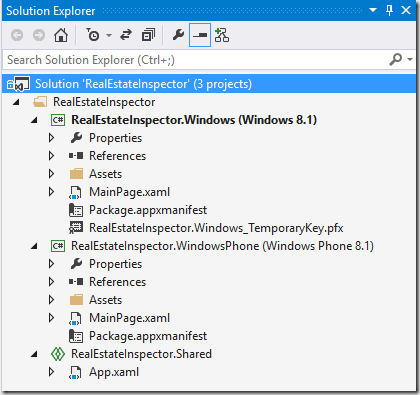 As I discussed in my initial post there are a number of components that make up the property inspection tool. In this post we’ll start by creating the initial solution structure, create and add in the Azure Mobile Service, and publish the Azure Mobile Service. 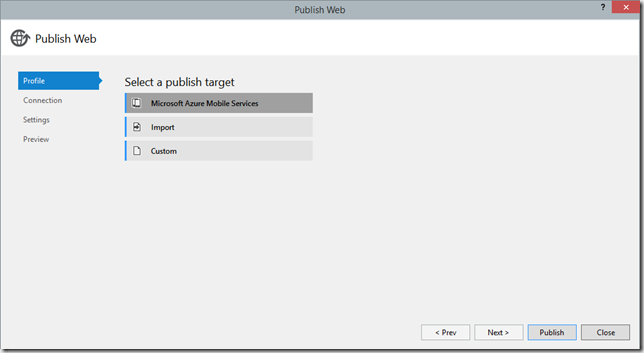 A lot of blog posts will start by creating the Azure Mobile Service and then use the template projects provided on the home page of the newly created Mobile Service. Sometimes this isn’t an option and you want to be able to integrate a Mobile Service into an existing application. 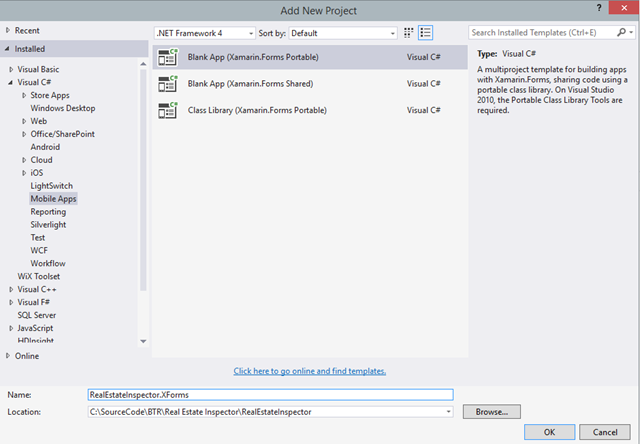 For this reason I’m going to start with a new project creating Visual Studio using the Blank App Universal template. This will create Windows and Windows Phone projects, with a Shared code project to handle files shared between the two applications. 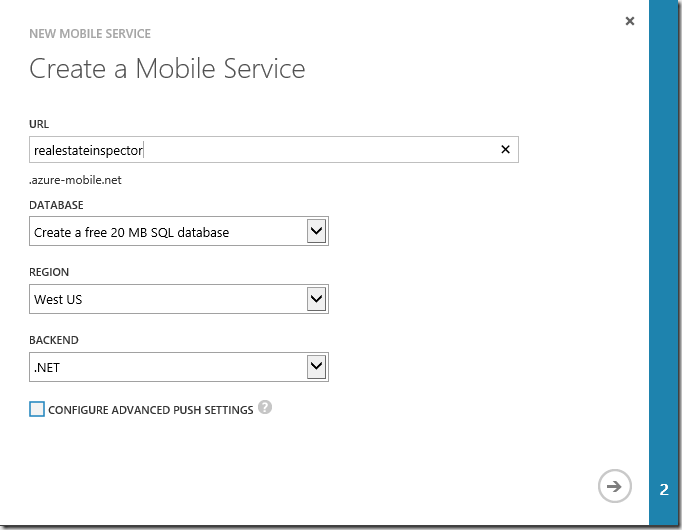 The next step is to create the Azure Mobile Service. 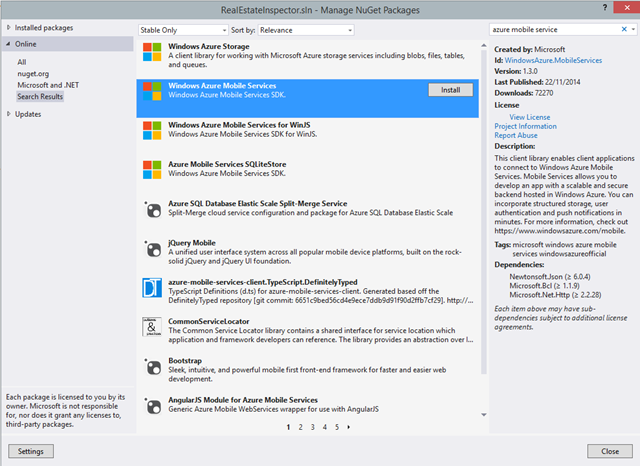 This can actually be done by right-clicking on the Mobile Services node in the Server Explorer window in Visual Studio but I’m going to have to go to the management portal to download the initial project for the Mobile Service anyhow. 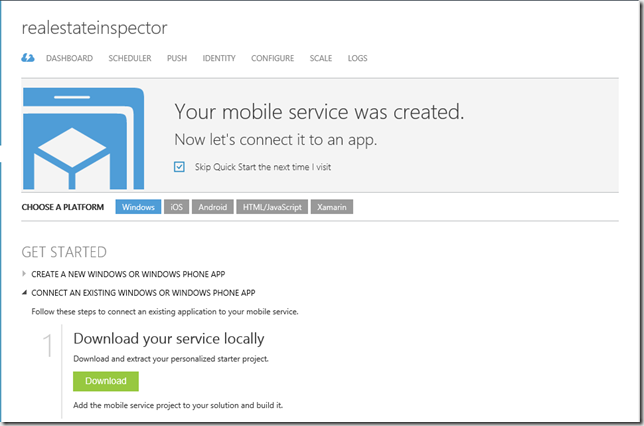 To create the Azure Mobile Service, navigate to the Azure Management Portal and select New >> Compute > Mobile Service > Create from the toolbar at the bottom of the screen. 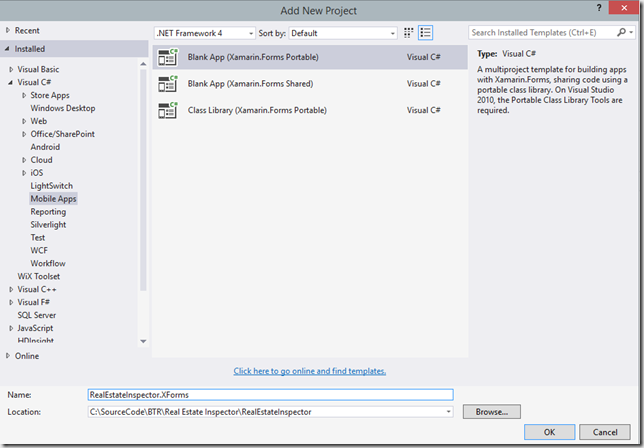 Complete the setup wizard – make sure you select the .NET backend. After completing the setup wizard, a few moments later the new Mobile Service will be available. However, before I can use it I need to publish the set of services - you can think of what I’ve done so far as just setting up a placeholder for where the services will live. To publish the Mobile Service I expand out the Get Started section on the home page of my newly created Mobile Service, and click on the Download link. I save the downloaded zip file, unblock and then extract the zip file. 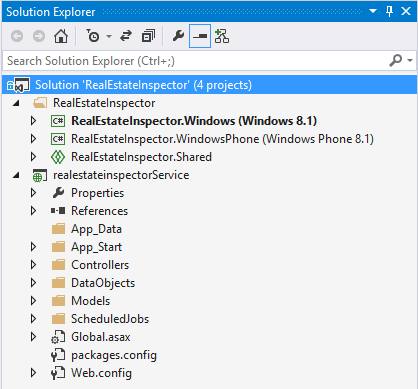 I then copy the service folder (in my case realestateinspectorservice) into the solution folder of the solution I created earlier. 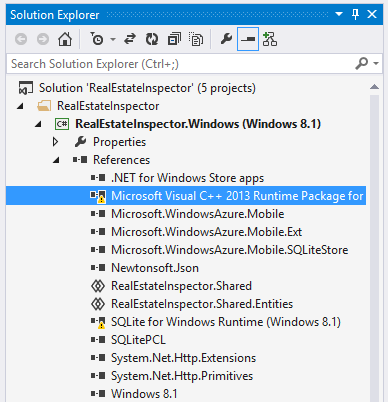 Back in Visual Studio I then add the existing realestateinspectorservice project into the solution. After selecting the Mobile Service to publish to, click OK and then the Publish button. This will cause the project to be compiled (and any required NuGet packages to be downloaded) and then published up to the Mobile Service. This may take a few minutes the first time as all referenced libraries will have to be copied up. However, future publish operations will be significantly quicker as they are by default differential. So this gets me part of the way through setting up my solution – the next thing to do is to connect the Windows and Windows Phone applications so that they can call out to the Mobile Service…..
I’m going to start the year by dissecting a typical business scenario which will demonstrate how the use of Windows, Windows Phone and Azure can be plugged together to quickly deliver a line of business solution. Throw in a bit of Xamarin and a web front end and you have a solution that will enable employees to use any device they choose in order to access the software. This will probably do for the time being; as we go we may introduce other elements to demonstrate the use of various platform components. What’s interesting to note at this point is that properties can be switched out for projects, and inspections for tasks, if this scenario were a task/issue/defect tracking system. 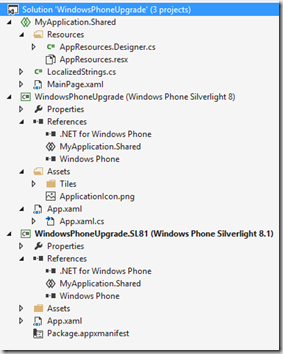 - Mobile devices – Naturally as .NET developers we gravitate to what’s easiest so we’ll include Windows and Windows Phone applications based on the universal app template which uses a shared code project to prompt reuse. However, we shouldn’t neglect the other platforms so we should include iOS and Android projects, using the Xamarin tooling. Our business logic we’ll abstract into a portable class library (PCL) to attempt to give us maximum reuse. 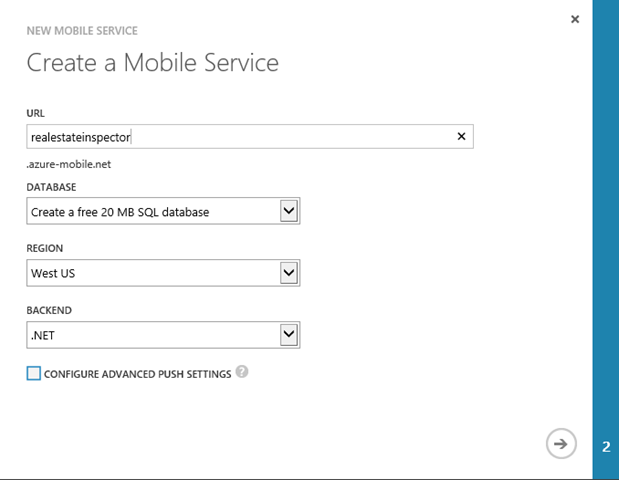 - Services – Azure Mobile Services will give us the raw scaffolding to stand up a SQL Server backend with services exposed to surface data to our mobile applications. These services support synchronisation which we’ll use to give the mobile applications offline support. - Authentication – As this is a line of business solution we’d prefer users to not have to remember another set of credentials. To this end the solution will use Azure Active Directory (AAD) to authenticate users and grant them access to the software. The users can be synchronised from the corporate AD into AAD so as to maintain a single set of credentials for any user. - Web application – An Azure Website will be used to provide desktop and mobile solution for those unable to use the mobile applications. Whilst this could go directly to the SQL Server backend, it will in fact be routed via the service tier to ensure a common authentication pattern and usage model for the data. - Scheduling – A scheduler will be setup in Azure for use by the solution in order to schedule particular jobs or operations to be carried out. For example the periodic generation and sending of reports. - Push Notifications – When new data is available, push notifications can be sent out to the mobile applications to either alert the appropriate user, or perform a background synchronisation of the new data. I’ll use this post as a reference for the components that I’ll be discussing in the coming posts. The components aren’t in any particular order and the posts won’t focus on individual components, rather how they connect together and what you need to know to get them to work together. The new Universal Application project promises to reduce the amount of code you need to write, but does it reduce the amount of design work you have to do? In this demo-heavy session, XAML guru Nick Randolph explores the tooling available in Blend and the patterns you’d use to produce stunning Universal Applications with a minimum amount of work. Mostly, when we build enterprise applications, we’re not starting from scratch. Deciding what to build, what to reuse and what to keep is an important part of the enterprise software development decision process. In this session, Nick will explore the conditions and requirements that might lead you to decide which of these approaches to take. He’ll also demonstrate some techniques for taking an existing Line of Business application and lighting it up with a modern, touch-friendly UI. If you’re attending in either session, come along and chat about the direction of the Windows platform and how to take advantage of it in your business. It turns out that we were referencing the Active Directory Authentication Library which in turn was making a native call that only showed up when we ran the WACK test. As we weren’t planning to deploy via the Windows Store we hadn’t run the WACK test recently and it was only by chance that I ran it to see if it threw up any errors. Fixing the errors and warnings not only addressed the installation issue it also highlighted some issues with the project structure (incorrect images sizes etc). For those who don’t know, I contribute a monthly segment over at Visual Studio Magazine called the Mobile Corner. Here are a couple of the most recent articles – I’ve cc’d them here because I feel that particularly the Enterprise Distribution article is of great value to companies looking to deploy applications internally. Don’t Use Any of the Built In TextBlock Styles!!! On face value this looks great – we have a simple TextBlock which is data bound and we’re using one of the out of the box styles, BodyTextBlockStyle. 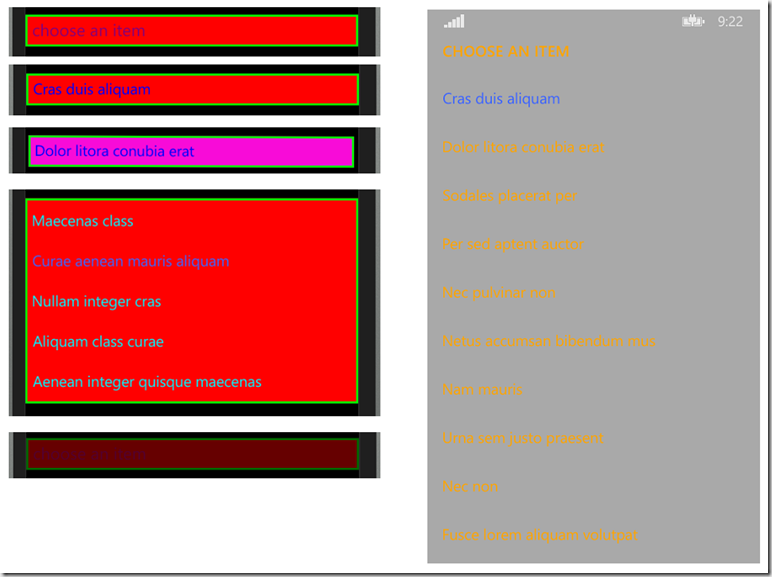 Unfortunately this inherits from BaseTextBlockStyle which sets the Foreground based on the current theme, as the following XAML snippet illustrates. When I use the NoForegroundTextBlockStyle instead of D, when I expand the ComboBox I see E (no item selected) or F (item selected) instead. Note how they pick up the foreground colour, including the accent colour for the selected item. Clearly the use of these three colors hasn’t been applied consistently through the ComboBox states so we’re going to have to dig deeper in order to tweak things. 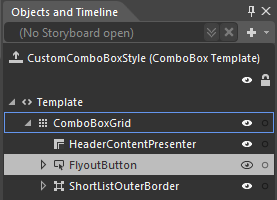 I’ll start by looking at the Template for the ComboBox by right-clicking on the ComboBox, selecting Edit Template, Edit a Copy. There are three components of the Template being the presenter for the header, a button and the border which will house the expanding list for when there are five or fewer items. The Button is what is displayed when there are 5 or more items. 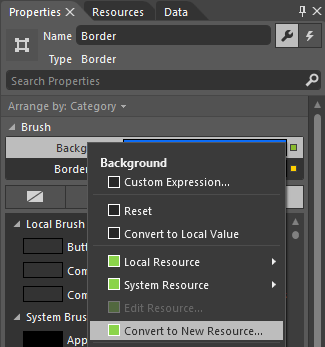 Selecting the Button we can see that both Background and BorderBrush are set but the Foreground is inherited. I’ll update this to be data bound using Template Binding to the Foreground button. We’ve sorted out the inconsistency in 1. This actually also sorted out the foreground color in 2 and 3. However, when the button is pressed, we still see the accent color coming through, which in most cases conflicts with the branding of our app. The question is what to replace it with…. this is an issue for another day; for now, let’s just change it to use a different static resource. 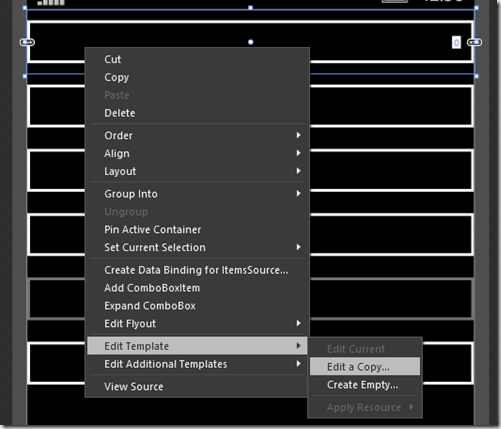 Right-click on the button, select Edit Template, Edit a Copy, which will take a copy of the button template and put Blend into template editing mode. From the States window, select the Pressed state. In the Objects and Timeline we can see that the Background on the Border element has been set to the accent color. 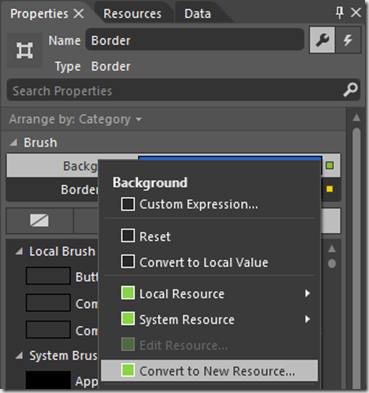 I’ll select the Border and from the Properties window select Convert to New Resource from the Background. 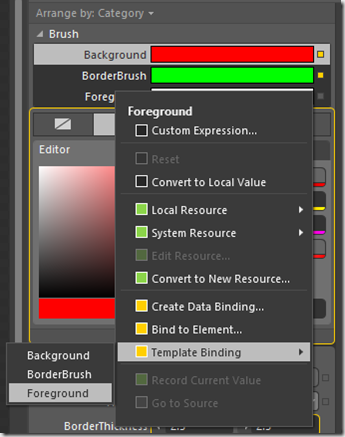 I’ll name the new resource ComboBoxPressedBrush and set the color to Pink so it stands out. Solving 4 includes fixing a few things: Background, Border, Foreground and Selected Foreground. First things first, let’s change the white background to the background set on the ComboBox. Looking at the template it would appear that the background is already set using data binding through Template binding to the Background being set on the ComboBox. However, at least two of the States in the template are adjusting the background – in fact the error shown in Blend is the result of some developer not understanding how visual state groups work, or being too lazy to establish a working set of states. Anyhow, what we want to do in this case is actually to adjust both states to remove any changes to the background property. We do also want to address the conflicting visual states by removing the Foreground property from the DropDownStates – Opened. 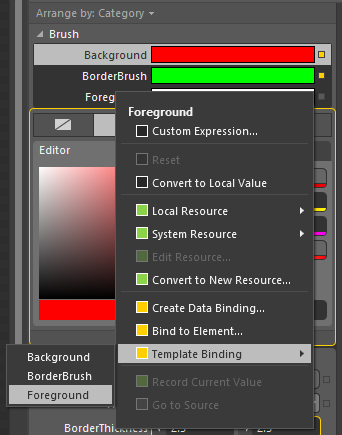 Also, remove the BorderBrush from the CommonStates – Highlighted state, which will fix the border on the expanded area. That solves number 4. The other part is to adjust the Disabled state of the FlyoutButton. As I did earlier I needed to edit the Template for the Button and set the disabled BorderBrush, Background and Foreground to the corresponding ComboBoxDisabled brush. The only thing this doesn’t affect is the header on the flyout page which still appears in white. To get this to use the Foreground value I just set I need to modify the FlyoutPickerTitleTextBlockStyle built in style (which is also in the generic.xaml file) by copy it into the application resources and altering the BasedOn value to use the NoForegroundBaseTextBlockStyle defined earlier. With these changes made we’ve got much better control over how the ComboBox displays text and how the border, background and foreground colors are applied. Hopefully in this post you’ve seen how you can jump in and alter colors throughout the ComboBox templates. 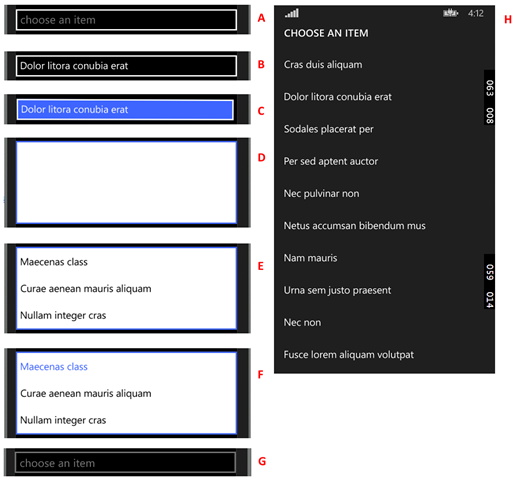 There are a series of built in colors both in generic.xaml and themeresources.xaml (C:\Program Files (x86)\Windows Phone Kits\8.1\Include\abi\Xaml\Design) which can be overwritten to do simple changes but sometimes you need to modify the underlying templates. 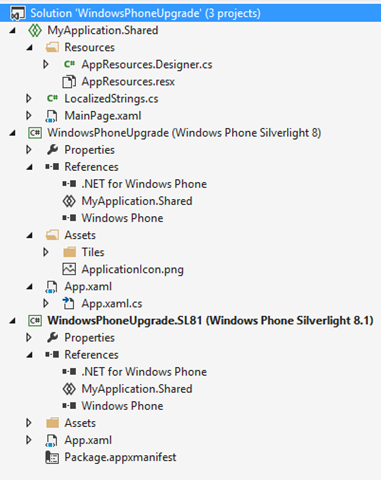 Over the last couple of days I’ve been trying to diagnose what we were doing wrong when code signing a Windows Phone 8.1 APPX file in preparation for enterprise distribution. The signing process completes successfully. 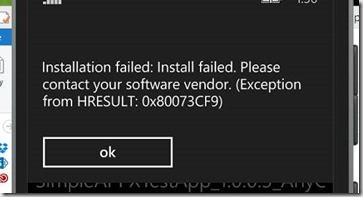 However, when we go to install the application on either device or emulator we were seeing weird errors (see image below that quotes an exception code of 0x80073CF9). So you either need to regress to the RC of Update 2, or go to the RC of Update 3. Side Note: If you see errors relating to a missing token, you’re probably attempting to install the package by calling AddPackageAsync from within an application that isn’t signed (ie a developer build pushed out using either the application deployment tool, or via Visual Studio). If you sign the application doing the installation and then install it, you should see the the call to AddPackageAsync will work for correctly signed XAP and APPX. This is a breaking change from Windows Phone 8.0 where this method worked regardless of whether the installer app was signed or not. 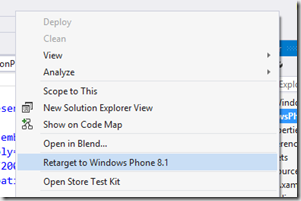 Step 1: The Build it Beta application is available in both the Windows and Windows Phone Stores. In order to test an application on your Windows Phone device, the first step is to download the Build it Beta application from the store. Step 2: After downloading and installing Build it Beta you then need to run and sign into Build it Beta. You can choose between one of the supported social network providers (Facebook, Twitter, Microsoft, Google) and use an existing or create a new set of credentials. You need to supply a valid email address so that we can identify your account. When you want to test and application you can simply send your application to upload @ builditbeta.com from the email address you entered. We’ll send you a confirmation after the application is available for testing. After signing in, you should be prompted to return to the setup instructions. Alternatively press and hold the back button and switch back to Internet Explorer where you should still have the setup instructions. Step 3: Install the Built to Roam enterprise deployment certificate. This certificate is required in order to install applications you want to test. Rather than deploying applications via the Windows Phone store, where they’re signed with a pre-trusted certificate, in Build it Beta all applications are currently signed using the Built to Roam enterprise deployment certificate. 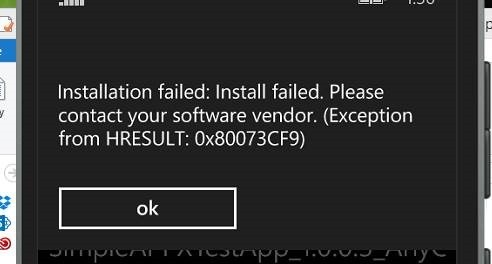 Installing this certificate won’t affect your ability to install applications from the Windows Phone store, nor does it affect any other enterprise enrolment you may have (eg via an MDM provider). Step 4: Install the Build it Beta Installer. Due to both technical and policy limitations on applications installed from the Windows Phone Store, Build it Beta relies on a secondary application to install the applications you want to test. Clicking the link in the setup instructions should prompt you to install this application. Unfortunately there isn’t a progress indicator or confirmation that it has been installed successfully – give this step a minute or two before moving on. Step 5: Launch the Build it Beta Installer. This will run the installer and pair it with the main Build it Beta application. Once you’ve completed this process you’re good to go – start sending your applications to Build it Beta to test them. Email – Simply email your xap or appx file to upload @ builditbeta.com. You’ll get a confirmation message back once the application has been ingested. Upload – If you have Build it Beta for Windows installed you can simply double-click your xap file. The application will be uploaded to Build it Beta. Attachment – Rename your xap file to .betaxap and email it to someone you want to test your application. Clicking the attachment will upload the application via Build it Beta for Windows Phone and make it available for the tester. Last Friday at the Windows Phone 8.1 developer training, run by Microsoft, Nokia Microsoft and Built to Roam, we asked the room how many people used Blend and knew about Visual States. I was shattered to see very few people even knew what a Visual State was, let alone use them in their code. 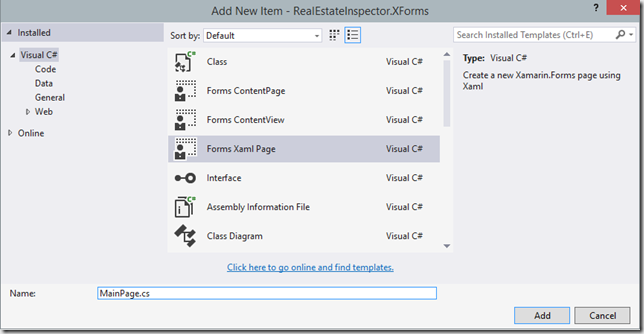 Visual States have to be one of the most useful aspects of the XAML system allowing you to define different states for not only your pages but also controls and user controls that you create. On Tuesday night before the Sydney Mobile .NET Developer Meetup I was talking with Lewis Benge about how developers on other platforms control aspects of their user interface. The consensus is that it’s very reactive in that as elements of their data model, or in the case of mvvmcross elements of the view model, change elements of the UI are adjusted. For example if you were displaying some form of a loading indicator whilst some data was being retrieved from a service, when the call was complete, the progress indicator would be hidden. In this simple case you might think that it’s just one line of code to show or hide the progress indicator but now repeat this two or three times and all of a sudden you have UI control code littered throughout your application logic. In the XAML world we’d simply define these as visual states and we’d move between those states as required. In fact, as you’ll see we can even represent these states within our view model so that the state, not the visual representation of the states, form part of our application logic (and can be isolated and tested independently as it can sit nicely within a PCL). >> At this point, you want to make sure that both your Windows Phone and Android applications build and can be run. They should both launch FirstView and contain a textbox and label with databinding working so that you can change the text in the textbox and it is updated in the label. We’re going to add a progress bar and a piece of text to say “Loading….” whilst data is being loaded. - If you switch between the Loading and Loaded states in Blend you should see the elements show and hide as expected. Now we need to wire up some logic to switch between these states at runtime. - Return to Visual Studio and go to the code-behind file for the FirstView (Windows Phone project). - To move our state logic into the ViewModel we’ll need a way to trigger the actual state change in the UI layer (ie the view). For this we’ll expose an event on the ViewModel which will include the name of the state that we want the view to transition to. We’ll start by defining a StateEventsArgs class which we’ll use to wrap the name of the state. This class includes a couple of helper methods to make it easy to generate an instance from an enumeration value, and to return an enumeration value. You might ask why we’re converting to and from strings – we’ll come back to this! - When you run this, there is a 5 second delay during the Start method in the FirstViewModel during which the Loading state should be visible. There after it should revert to the Loaded state. - Let’s flip across to our Android project and amend the FirstView to include the following xml. 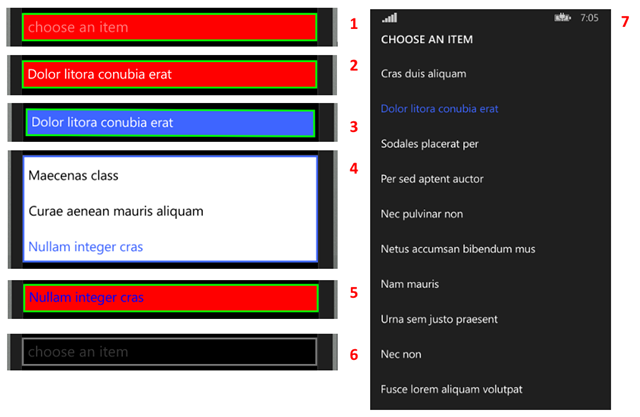 - Note that unlike in XAML for Windows Phone we can’t define the visual states in xml. Instead we define them as a set of Actions which will be invoked when transitioning to a particular state. 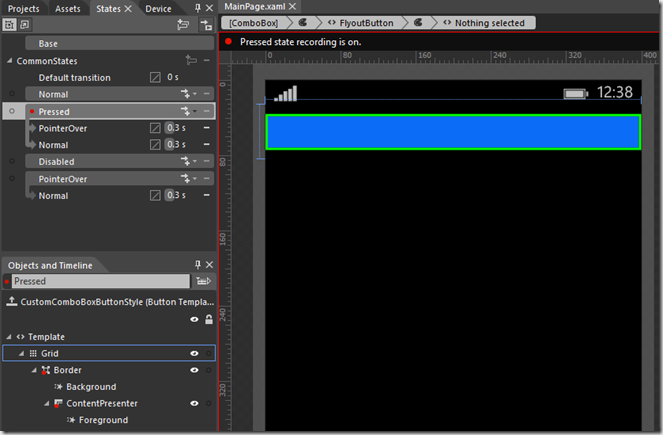 In this case we’re setting the progress bar to indeterminate and changing the button color for Loading state. You’ll notice that unlike in XAML where we could rely on the state manager to revert state changes (ie Loaded state simply reverses any changes applied by the Loading state), here we have to be explicit about all changes we want to occur. - When the StateChanged event is trigger, we find the appropriate Action by looking in the state Dictionary. The Action is then invoked to apply the appropriate visual changes. 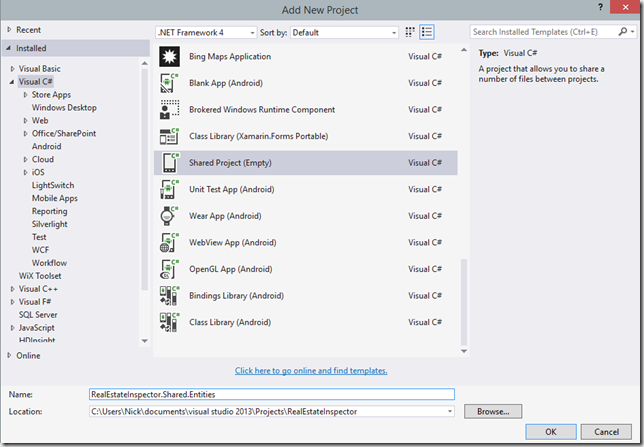 In this post I’ve walked you through the basics of how you can use visual states across both Android and Windows Phone, controlled from within your view models. This same model can be applied to iOS and of course the code for wiring up the state changed event can be abstracted into base view models and base views so you don’t need to add it to every page.